R.I.P. Jared Leto's hair bun. The Golden Globes winner hit the SAG Awards with a very shocking hairstyle, and by "shocking" we mean he wasn't rocking the bun like he was last weekend. Instead, the Dallas Buyers Club star, who is up for Best Supporting Actor tonight, let his hair flow free! As free as the wind that is blowing through the red carpet. Just kidding, it's very hot out there. 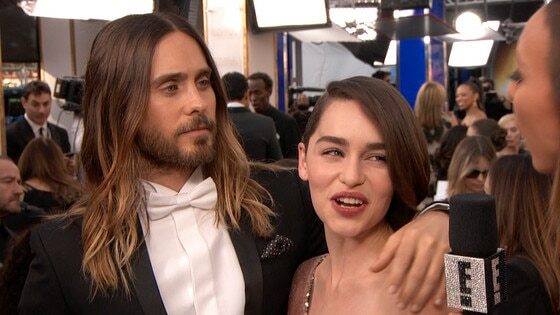 Leto, who is dominating the awards season for his transformative performance as Rayon in the Oscar-nominated film, interrupted Giuliana Rancic's interview with Game of Thrones beauty Emilia Clarke to give the Khaleesi a big ol' hug. After a quick introduction, things got real cute between the two. "I haven't seen your show but I know people are obsessed with it and say it's absolutely amazing," Leto gushed to her. "See, I know your band and I've seen your movie," one-upped Clarke. After the sweet exchange, G said goodbye to Clarke to get some one-on-one time with Leto, but the 30 Seconds to Mars front man wasn't letting her go anywhere. "I haven't finished here! There's work yet to be done," he said while still maintaining a grip on the GoT star. "Have you looked into her eyes? I mean, they're absolutely insane." That comment got Clarke turning real pink in the cheeks. "I'm blushing!" she laughed while bashfully looking away from the cameras. Oh, stop it, you two! Adorable. PHOTOS: Check out some of the 2014 SAG Awards' most notable nominees!